It's time to come off the wall and get back to reality at Burton tomorrow when we try to get back onto the winning track in the League and not just in the LDV Trophy. There's no getting away from it, though it was a great win at a ground that we rarely get any joy from, Boston weren't really at the top of their game and didn't make much of a fight of it. Burton may be a different matter and they might actually want to get a result against us. They've seen a recent improvement in results and can include a brilliant win against Peterboro in the the FA Cup two weeks ago as probably one of their best wins in a long time. They topped that with a 3-1 win against Crawley Town at the new Pirelli Stadium last Saturday. They have a trio of ex Harriers in their ranks in Lee Ayres, Andy Ducros and Andy Corbett and we have one of theirs in Laurie Wilson - plenty of 'ands' there for people who think that ands come in handy. Ducros, who has the privilege of being the Harriers most expensive signing at £80,000, has failed to make a first team place his own this season and, just as it was in his time with us, he finds himself on the bench more often than he would like. 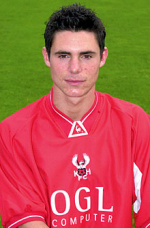 Corbett never really made the grade at Aggborough and was released to Nuneaton in March 2003. After all the rumours that Iyseden Christie, Mark Jackson, Wayne Hatswell and Terry Fleming were on their way out of the club it appears that now yet another petty deadline has passed and they are all still here to fight another day and fight for the cause. Issey did his case no harm against Boston by scoring a couple of well taken goals to answer his critics that he has to be able to walk the ball into the goal or take a tumble to get himself on the scoresheet. Now he's staying he should get a bit more confidence to really hurt teams in the way that we know he can. There were no new players coming in for either side by Thursday evening so what we have is what we get. Injury wise it's the same old faces with Simon Russell and Martin O'Connor out but Gareth Sheldon should be coming back soon and that might be tomorrow. I'm looking for a win here and although it'll be a tough game I think we're just starting our purple patch. Danby, Lewis, Hatswell, Burgess, Evans, Mullins, Ludlow, Jackson, Pugh, Flynn, Fleming, Graves, Heslop, Hurren, Penn, Christie, Atieno, Hollis, Sheldon, Wilson, Blackwood, Thompson. Taylor, Deeney, Henshaw, Webster, Corbett, Tinson, Austin, Ayres, Stride, Ducros, Gilroy, Hall, Clough, Bell, Sedgemore, Anderson, Shaw, Harrad, Todd.